I have a confession to make: I am a pretty big geek. I've spent the weekend rebuilding my computer, watching anime, and playing video games. Not the first-person shooter types; RPGs and "artsy" games. I have a decent grasp of the sci-fi world, so when a (similarly geeky) friend showed me that io9 was doing a countdown of the "100 Albums Every Science Fiction and Fantasy Fan Should Listen To," my ears perked up. and let you look through the list on your own. It has some pretty interesting stuff on it, and I've been exposed to some artists and albums that I really like. In fact, that brings us to the real reason I'm writing this post today. I hadn't heard of Add N to (X) prior to reading said top-100 list. 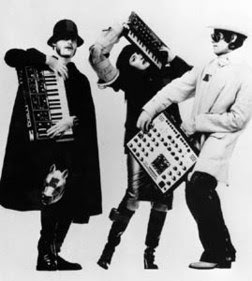 They were a trio from London who made some crazy cool electronic music, along with some very edgy artwork and videos. Here's a song off 1999's Avant Hard that I really dig. And though I was never the most loyal fan of the Beastie Boys, I do want to recognize the passing of Adam Yauch, aka MCA. From what I can tell he was one of the most genuine artists out there, and a good guy to boot. I do appreciate how the Beasties have always done their own thing with conviction and a sense of humor, while so many others are out there "rapping like it's a commercial." Rest in peace, MCA, and thank you for what you gave us while you were around.